After a long day enjoying the city of Victoria come back to your own beautiful suite. The building is extremely safe with locks and a fob security system. 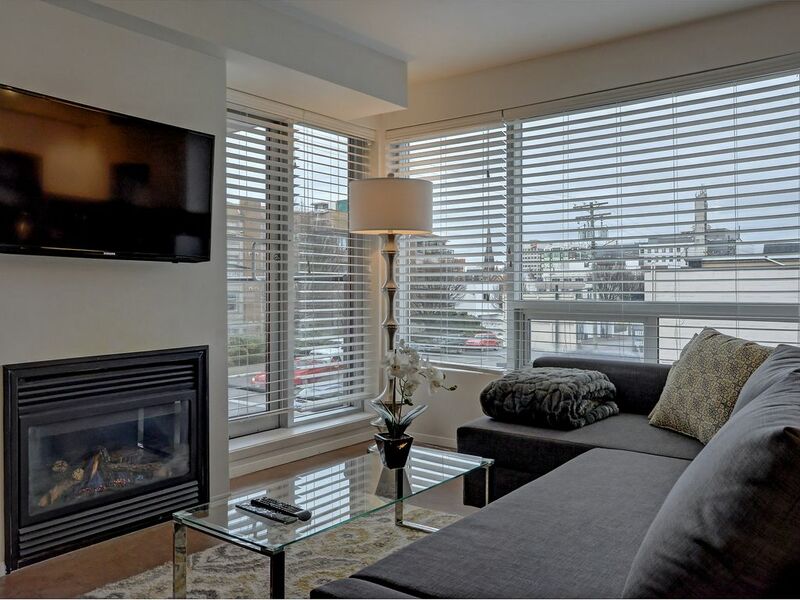 On a nice day settle in with a drink on the private balcony with views of downtown or settle in front of the gas fireplace, snuggle in tight and watch a movie! With beautiful mirrors and chandeliers the room has a sparkle. There is a full kitchen with stainless steel fridge, stove and dishwasher. Making cooking and cleaning an easy task. There are beautiful dishes, glassware and everything else needed in the kitchen. If you are not the type to cook we have a Keurig for you to enjoy a coffee in the morning. All of Victoria's restaurants are within walking distance and in the room you will find information to help you make some decisions. Then settle in for a good nights rest in a Queen size bed with fine linens and pillows. This is a family owned business and we are excited to have you stay with us and enjoy our city. Being locals in Victoria is very important to us and we hope to share that experience with you! Full bathroom with a tub to relax in. Beautiful quality linens and pillows. Free wifi in the unit. Password is located in the information binder. The couch does turn into a bed but we do require a $20.00 per night fee for an extra guest. There is a small table with 2 chairs to enjoy light meals. Private balcony with views of the city. There are 2 comfy chairs and a table to enjoy the view. Host was very responsive, location close to downtown and the parking was secure (and free!) Small studio, but that was expected. Very nice kitchen and bath. Good view. However, even though the temperature outside was in the 40's (F) outside, the apartment was very hot and stuffy. There was only one tiny window that could open, the large windows faced the afternoon sun and there was NO cross-ventilation. We left the balcony door open and used the fan, but that was noisy when we tried to sleep. This place needs an air-conditioner!! I can't even imagine staying there in the summer months, as we were there in late October and found it difficult to sleep because of the heat. Very clean and stylish place, good location and had every we needed. We were very comfortable here and Grace was a great host. Minuses: Ventilation would have been rough had it been more then 80F. outside. A lot of street noise, and the neighborhood was a little sketchy. Pluses: The condo was clean, comfortable and well furnished. Parking was convenient. Walking distance to downtown. Nice coffee shop at ground level. All-in-all a very good value and a pretty nice place. This little condo was awesome. It's small but it had enough room for three people. The best thing is the location. It's literally walking distance from downtown. We just parked our car in the garage the whole time we were there and just walked everywhere. 10/10 would recommend. We do charge a fee of $20.00 per night for an extra guest.